Advances in left ventricular assist device (LVAD) therapy have resulted in increasing numbers of adult LVAD recipients in the community. However, device failure, stroke, bleeding, LVAD thrombosis and systemic infection can be life-threatening emergencies. Currently, four LVAD systems are implanted in six UK transplant centres, each of which provides device-specific information to local emergency services. This has resulted in inconsistent availability and content of information with the risks of delayed or inappropriate decision-making. In order to improve patient safety, a consortium of UK healthcare professionals with expertise in LVADs developed universally applicable prehospital emergency algorithms. Guidance was framed as closely as possible on the standard ABCDE approach to the assessment of critically ill patients. There are increasing numbers of left ventricular assist device (LVAD) recipients in the community. These patients are vulnerable to device failure, stroke, bleeding, systemic infection and LVAD thrombosis, all of which can be life-threatening for the patient and a significant challenge for ambulance clinicians. Centres which implant LVADs provide device-specific information to local emergency services when a patient leaves hospital, but this has resulted in inconsistent availability and content of information, risking delayed or inappropriate decision-making in an emergency. If distributed to and used by ambulance clinicians in the UK, the algorithms presented here can improve safety for adult LVAD recipients who experience an out-of-hospital emergency. Four types of LVAD system are implanted in the six UK adult heart transplant centres, in Birmingham, Glasgow, Harefield (London), Manchester, Newcastle and Papworth (Cambridge): Medtronic Inc. HVAD, St Jude Medical Inc. Heartmate II with original controller or with pocket controller and Heartmate 3. All contain a rotating impeller that propels blood from the left ventricle to the aorta.9 LVAD recipients are normally ambulatory adult outpatients who, despite subnormal exercise tolerance,10 travel extensively within the UK. However, LVAD failure is a life-threatening emergency.11–15 This dependency arises for two reasons: (1) without support, the dysfunctional left ventricle may not be able to generate an adequate cardiac output to sustain life and (2) the device contains no valves, so when an LVAD fails, there is retrograde blood flow through the device during ventricular diastole limiting systemic perfusion.16 Moreover, LVAD outpatients are vulnerable to other complications,17 18 particularly stroke,19 bleeding,20 21 systemic infection22 23 and LVAD thrombosis,.24 25 The modus operandi and troubleshooting of LVADs is reviewed in the current issue of this journal.26 Individual VAD centres have developed local policies to support discharge of their LVAD recipients into the community, including provision of information for ambulance clinicians and EDs.27 However, there is no universal LVAD-specific training standard for emergency medical services in either the USA or Europe and this has resulted in inconsistent availability and content of information, with attendant risks of delayed or inappropriate decision-making.28–30 The aim of this initiative was to develop emergency algorithms, applicable to all current LVAD systems, for national distribution to ambulance clinicians. A consortium of UK healthcare professionals—VAD coordinators, heart failure and VAD cardiologists, cardiac electrophysiologists, cardiothoracic surgeons with expertise in VADs and transplantation, cardiothoracic intensivists, trauma consultants, resuscitation practitioners, senior paramedics, medical directors of UK ambulance services and clinicians from the Resuscitation Council (UK)—contributed to the initiative. Discussion was guided by published LVAD emergency guidance,31 including web-based information, case reports and anecdotal UK experience. The guiding principles identified are shown in figure 1. Guiding principles identified for the development of emergency algorithms. LVAD, left ventricular assist device; DC, direct current. We have previously recommended that, at the time an LVAD patient is discharged from the hospital, local emergency services and emergency departments (EDs) are notified and offered information and training to support any response to an LVAD emergency,27 including the VAD centre 24/7 emergency contact telephone number, the patient’s address, home telephone number and key medical information. This is referred to as the Patient Specific Protocol (PSP) which should be updated to reflect significant changes in clinical status, for example, heart transplantation and consequent LVAD removal. In the event of an emergency call from the patient’s home, relevant information can thereby be made available to ambulance clinicians prior to patient contact. Discussion revealed anecdotal evidence that PSPs have allowed advance contact with UK VAD centres with attendant benefits, that is, the provision of relevant recent medical history and telephone guidance to ambulance clinicians by the VAD coordinator during emergency treatment. Establishing advance contact with the VAD centre following notification of an emergency, provided it does not result in delayed treatment, is recommended (see Algorithm 1). Ensuring adequate circulation to sustain life. These algorithms are presented as figures 2–4, respectively. Also provided are illustrations to allow identification of the LVAD system and provide instructions on disconnection and reconnection of the external components; diagrams showing the external components of the Medtronic HVAD, St Jude Heartmate II (original version), Heartmate II (pocket controller version) and the Heartmate three are presented as online supplementary figures 1–4, respectively. Initial assessment of the left ventricular assist device (LVAD) patient (Algorithm 1). Left ventricular assist device (LVAD) troubleshooting (Algorithm 2). Ensuring adequate circulation to sustain life (Algorithm 3). CPR, cardiopulmonary resuscitation; LVAD, left ventricular assist device; VF, ventricular fibrillation; VT, ventricular tachycardia. The algorithm encourages obtaining early information whenever possible—from the PSP, by contacting the VAD centre and from the patient, their family or other bystanders. Important note: These algorithms are intended only for use with LVAD recipients who have experienced sudden clinical deterioration. For clinically compromised LVAD recipients, where the LVAD has been non-functional for more than a few minutes, restarting the LVAD carries a theoretical risk of release of thrombus from the LVAD and embolic stroke. However, this risk may be offset by bidirectional blood flow through the non-functional LVAD16 and systemic anticoagulation. In a patient who is critically ill or in circulatory arrest, the balance of risk and benefit favours restarting a non-functioning LVAD. If LVAD non-function is suspected in a patient who is not severely compromised, immediate advice should be sought from the VAD centre. This part of the assessment starts by determining if the LVAD is running. Unresponsiveness and absence of normal breathing usually implies circulatory arrest. In an LVAD recipient, sudden failure of the LVAD is the cause most likely to be corrected by prompt, appropriate intervention. Sudden LVAD failure does not always cause circulatory arrest, so in an LVAD patient who is very ill but breathing, it is still important to check at this stage whether the LVAD is running. Clinicians should minimise delay by avoiding futile repeated attempts to palpate a pulse and record the arterial BP and oxygen saturation as these may be difficult or impossible to detect in compromised LVAD recipients (see Further assessment of circulation section for more details). A loud alarm coming from the controller is likely to indicate a stopped LVAD, unless the display shows another explanation. If no alarm is sounding, LVAD failure is still a possibility (due to alarm battery depletion or alarm failure), so a stethoscope should be placed over the apex of the heart to listen for a humming sound. Absence of a humming sound indicates that the LVAD is not working. 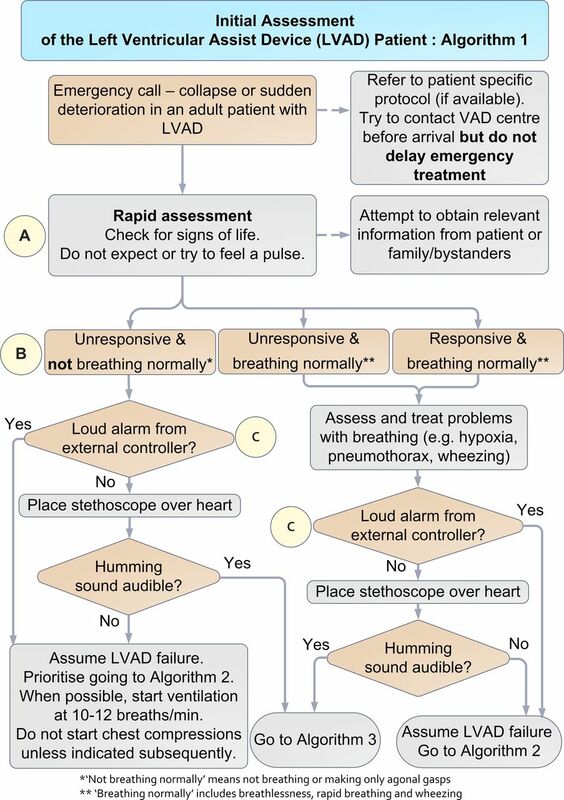 If a loud alarm is sounding, (with no other cause shown) or the pump is inaudible via stethoscope, the clinician is directed to Algorithm 2 (LVAD troubleshooting). If the LVAD is running normally (no alarm and audible hum via stethoscope), they are directed to Algorithm 3 (ensuring adequate circulation to sustain life). the supply of power to the external controller, either via a rechargeable battery or mains power (figure 3). The percutaneous driveline usually exits the skin over the abdomen to the right of the umbilicus (see figure 3). All adult LVADs in use in the UK have two power connections to the controller, both of which are usually connected, although only a single working power source is needed for the LVAD to operate. This allows replacement of one power source, without interrupting LVAD operation. The controller and batteries may be carried in a bag, contained within pockets of the patient’s clothing or belt-mounted. If the LVAD is not running, first, check the external components of the LVAD. The clinician should open the LVAD bag containing the controller and batteries to expose the contents, and check that all connections to the controller are fully engaged and secure. Next, they should check the battery charge by pressing a button on the battery that illuminates a display similar to a fuel gauge. If the battery charge level is low, the power source must be changed. Depleted batteries should be replaced with charged ones or with a mains power supply. If a mains power supply is in use and potentially defective, the device should be switched to a charged battery. If these measures fail to restart the LVAD, it is presumed that the controller is defective. The spare controller (carried by the patient at all times) should be connected to a charged battery (or mains power). 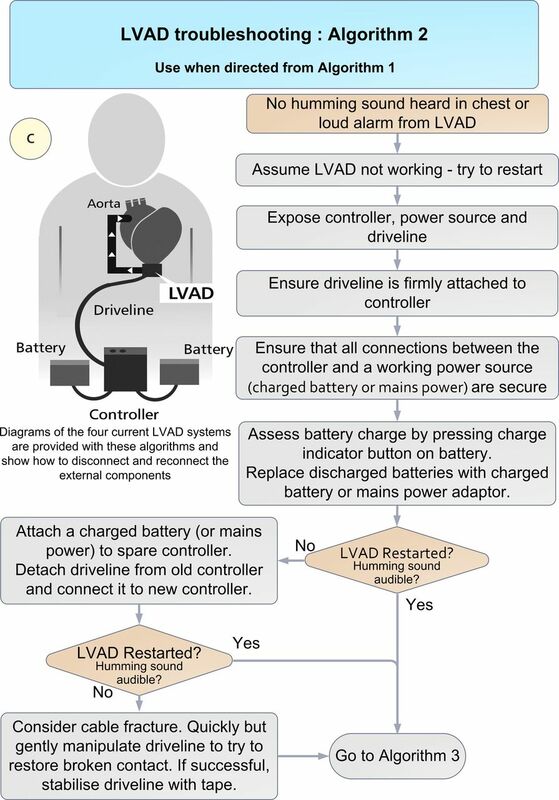 Then, the driveline should be disconnected from the presumed-defective controller and connected to the replacement controller whereupon the LVAD should restart. If these actions do not restart the LVAD, the possibility of cable fracture within the driveline causing loss of electrical continuity should be considered. If suspected, gentle manipulation of the driveline may restore LVAD operation, in which case, the driveline should be stabilised (using tape). in an emergency bag carried separately by the patient. Active LVAD audible alarms are often accompanied by warning messages displayed on the controller screen. Such messages either indicate an LVAD fault which may cause rapid clinical deterioration or may be indicative of a clinical problem causing LVAD parameters to fall outside the normal operating range. Alarm messages thus facilitate diagnosis of LVAD-related or medical issues and should be reported to the VAD centre coordinator who can provide appropriate advice. The exception to this is the Heartmate II operating with the original controller, which does not display a message. 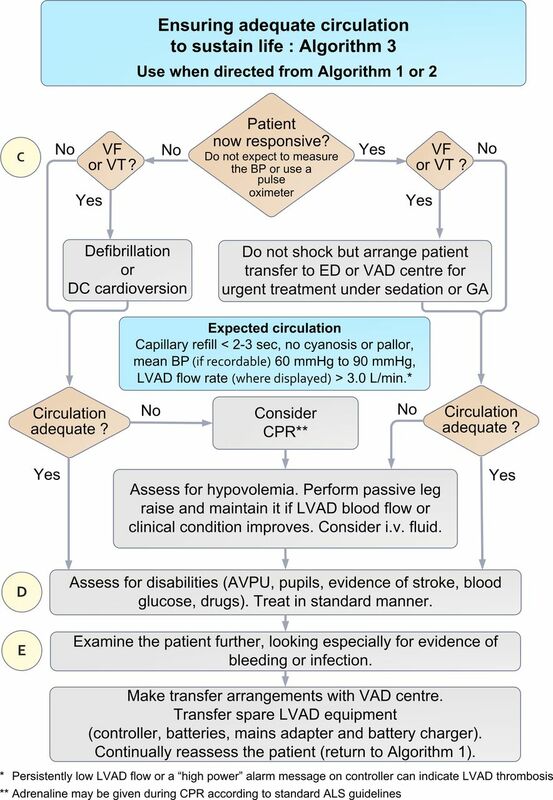 Whether the LVAD was found to be running, or an attempt has been made to restart a non-functioning LVAD, the third algorithm should always be followed irrespective of clinical status and aims to ensure an adequate circulation. This includes checking the underlying cardiac rhythm, looking for signs of adequate perfusion and treating if necessary. Subsequently, the patient should be assessed for disabilities (eg, stroke, glucose, drugs) and examined for evidence of bleeding and infection. Finally, transfer arrangements are made in consultation with the VAD centre. Many LVAD recipients also have a cardiac resynchronisation therapy (CRT) pacemaker and, in some, their device incorporates an implantable cardiac defibrillator (ICD). Some have an ICD without CRT. An ICD would be expected to deliver a shock in the event of ventricular fibrillation (VF) or rapid ventricular tachycardia (VT). If a patient is unresponsive, and has VF or VT (with ICD not present or ineffective), immediate defibrillation (VF) or cardioversion (VT) is indicated. Some LVAD recipients without ICDs may be temporarily tolerant of what would normally be considered to be life-threatening ventricular arrhythmia (VF or VT) because LVAD operation is ECG independent and passive blood flow through the right heart and pulmonary circulation may sustain enough venous return to the LVAD to maintain systemic blood flow and consciousness.34 A responsive patient with VT or VF should be transported to the hospital for urgent treatment. If the patient becomes unresponsive during an episode of VT or VT prior to arrival at hospital, they should receive immediate defibrillation or cardioversion. In addition to cardiac rhythm assessment and treatment (if indicated), ambulance clinicians should look for clinical signs of an adequate circulation (eg, capillary refill time less than 2 s, absence of pallor/cyanosis). Emergency treatment must not be delayed while repeated attempts are made to measure arterial BP or pulse oximetry in LVAD patients; contemporary pumps produce continuous (non-pulsatile) blood flow, resulting in an attenuated arterial pulse pressure which typically renders ineffective usual sphygmomanometry35 and pulse oximetry.30 31 If arterial BP can be recorded, hypotension is a normal finding in LVAD recipients; a mean arterial BP between 60 and 90 mm Hg would be considered acceptable.36 37 Of the LVAD systems currently in use in the UK, all except the St Jude Medical Inc. HeartMate II—Original Controller (see online supplementary figure 2) can display LVAD blood flow rate. Normally, the Medtronic HVAD (online supplementary figure 1) displays the flow rate continuously on the controller screen unless an alarm message is displayed, in which case the flow can be displayed by pressing the button adjacent to the display marked with an arrow. The St Jude Medical Inc. HeartMate II—Pocket Controller (Online supplementary file 3) and HeartMate 3 (online supplementary figure 4) display LVAD flow rate if the controller button with a square symbol is depressed twice. In adults, flow is normally in the range of 3.5–6.5 L/min, and flow persistently less than 3.0 L/min should be regarded as critically low. In an LVAD patient who is unresponsive, not breathing normally and has evidence of inadequate circulation (despite a running LVAD or all attempts to restart it), cardiopulmonary resuscitation (CPR) should be considered. It is unclear whether CCs confer benefit if they are implemented prior to trying to restart an LVAD. It is reasonable to conclude that the balance of risks favours delivery of high-quality CCs by ambulance clinicians to LVAD recipients with out-of-hospital circulatory arrest either if attempts to restart an LVAD have failed or as a temporising measure until definitive intervention is possible, for example, while searching for missing emergency LVAD equipment to restart a LVAD which is not running. Patients receiving CPR should have ECG monitoring in standard fashion; those with recurrent VF or VT should receive immediate defibrillation. Epinephrine may be given during CPR according to standard ALS guidelines. Hypovolaemia can reduce LVAD flow to critical levels. If this is the case, CPR should be commenced prior to the assessment of hypovolaemia. Otherwise, hypovolaemia can be assessed and treated without CPR. Hypovolaemia may be recognised by the display showing low LVAD flow (<3 L/min), with or without an audible alarm. Risk factors for hypovolaemia include a history of bleeding (notably gastrointestinal). When hypovolaemia is suspected, intravenous fluid should be given. Sustained passive elevation of the legs may provide a transient increase in venous return and help to maintain perfusion until the fluid has been administered.39 40 If passive leg raising is followed by a transient increase in flow rate through the LVAD (sometimes for less than a minute), this supports the likely need for intravenous fluid. Positive responses to fluid administration include an increase in the displayed LVAD flow rate and clinical evidence of improved circulation. However, administration of excessive fluid can potentiate right heart failure; further advice can be provided by the VAD centre. LVAD thrombosis is a serious complication which may be accompanied by signs of an inadequate circulation and is usually characterised in one of two ways: (1) Persistently low LVAD flow despite euvolaemia; this can be due to partial occlusion of the LVAD blood path by thrombus. (2) Thrombus formation at the impeller/pump-housing interface causes increased friction on the impeller, resulting in excessive LVAD power consumption that may be intermittent or continuous and may activate a high-LVAD power alarm. Impinging thrombus causing excessive power consumption can lead to overestimation of pump flow. If signs of an inadequate circulation persist despite appropriate treatment, pump thrombosis should be suspected and the situation discussed with the VAD centre. If the circulation has been stabilised or was stable from the outset, potential causes of clinical compromise (eg, haemorrhagic or embolic stroke, bleeding, sepsis or drug therapy) should be considered using the ‘Disability’ and ‘Exposure’ components of the ABCDE approach. Whether a patient should be transported to the local ED or to the VAD centre should be determined by dialogue with the VAD centre. This decision will depend on the patient’s clinical condition and logistic considerations. Appropriately trained caregivers should be encouraged to accompany the patient during ambulance transfer to hospital. It is of paramount importance that all emergency LVAD equipment (including the spare controller, rechargeable batteries, mains power adapter and battery charger) is transferred to hospital with the patient, as sustained LVAD function is dependent on the availability of these components. It is important to monitor the patient continuously during transfer as clinical deterioration can be sudden. The provision of effective training of healthcare providers in prehospital management of LVAD-related emergencies is a substantial challenge. The use of multiple LVAD designs has rendered comprehensive, device-specific training of ambulance clinicians impractical. 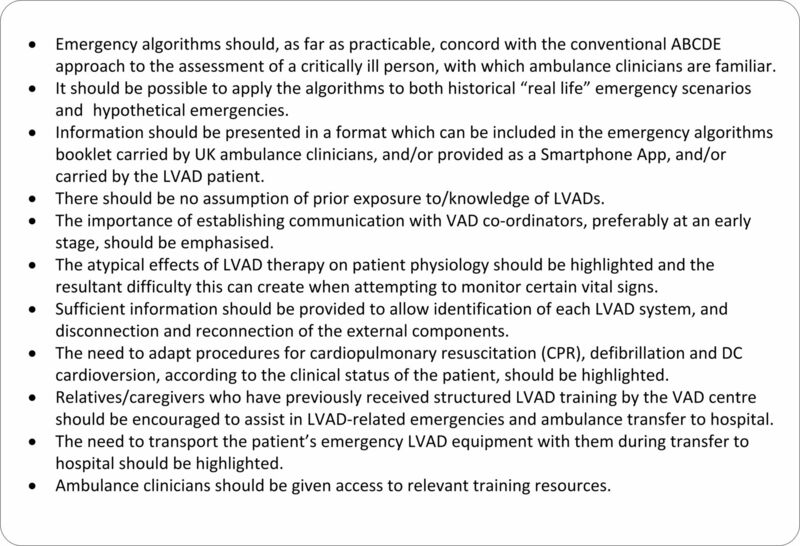 To address these limitations, the strategy adopted here was to develop emergency algorithms generalisable to different LVAD designs and to avoid potentially counterproductive complexity. Emphasis has been placed on establishing communication with the implanting VAD centre and provision of readily accessible resources for use in an emergency. This initiative has the support of the UK Joint Royal Colleges Ambulance Liaison Committee. Further work is needed to implement the proposals fully and assess their impact. There is evidence of sporadic initiation of advance statements (living wills) or Advance Decisions to Refuse Treatment (England and Wales), (ADRTs), in UK LVAD outpatients. More frequently, do-not-attempt-CPR decisions have been recorded by healthcare professionals for LVAD inpatients typically with participation of the patient in the decision-making process if they have the capacity or otherwise their family or authorised representative.41 The increasing international use of LVADs for destination therapy in more elderly patients has focused debate on end-of-life care planning, with more patients preferring to die in their home rather than in hospital.42 The consortium recommends that the existence and location of advance statements, ADRTs and recommendations about CPR and/or other life-sustaining treatments should be recorded in the PSP. Unless there is a valid and applicable advance statement, ADRT or other recommendations warranting a different response in a community setting, the measures recommended in these algorithms may be assumed to be appropriate for any critically ill LVAD recipient. The information provided is neither comprehensive nor directly applicable to partial-support LVADs (where the left ventricle continues to contribute to systemic blood flow), biventricular assist devices, total artificial hearts (where the heart is replaced with two prosthetic ventricles), to certain LVAD designs used in younger children or to alternative forms of mechanical circulatory support. However, in the UK, such treatments are currently very rare, and so are unlikely to be encountered by ambulance clinicians. It is anticipated that the distribution of these emergency algorithms to ambulance clinicians will increase the probability that out-of-hospital emergencies in LVAD recipients will be managed appropriately. The efficacy of this initiative should be determined by means of a national audit. The consortium is indebted to Mr Garry Johnson, Medtronic for agreeing to provide financial support for this initiative, to Mr Martin Smith of Origin8Design and Anne Wadmore for illustration services and to Rhiannon Taylor, Senior Statistician, National Heart Service Blood and Transplant, UK for LVAD population statistics. National Health Service. 2015. Annual report on ventricular assist devices. UK: National Health Service Blood and Transplant. National Institute for Clinical Excellence. Implantation of a left ventricular assist device for destination therapy in people ineligible for heart transplantation. UK: National Institute for Clinical Excellence, 2015. Report No: IPG 516. Man survives after LVAD battery almost fails. J Emerg Med Serv 2010 http://www.jems.com/articles/2010/08/man-survives-after-lvad-batter-0.html (accessed Nov 2016).
. Patients with a ventricular assist device need special considerations. J Emerg Med Serv 2012 http://www.jems.com/articles/print/volume-37/issue-2/patient-care/patients-ventricular-assist-device-need.html. Resuscitation Council. Resuscitation Guidelines 2015. Adult basic life support and automated external defibrillation. www.resus.org.uk/resuscitation-guidelines/adult-basic-life-support-and-automated-external-defibrillation (accessed Nov 2016). Resuscitation Council. Resuscitation Guidelines 2015. Adult advanced life support. www.resus.org.uk/resuscitation-guidelines/adult-advanced-life-support (accessed Nov 2016).
. Body position and activity, but not heart rate affect pump flows in patients with continuous-flow left ventricular assist devices. J Am Coll Cardiol: Heart Fail 2014;2:323–30.
. Withdrawal of ventricular assist device support. J Palliat Care 2005;21:151–6. ↵ i Audit data provided by CB, NW, PL, SK, LM and JD (January 2016). Contributors CTB chaired the consortium and is guarantor of the manuscript’s content. RH, NW, PL, SK, LM and JD and MF provided audit data. CTB, BR, JB, CB, MM, AR, IMG, CG, NRB, SS, AS and DP contributed to algorithm development. TB, DG, PC, JP, PK made contributions during the meetings. All authors contributed to the development of the manuscript and approved the final version. Competing interests RH and AS have had remunerated consultancy agreements with Medtronic which provided funding for this initiative.